Harrison Radio, NYC any images?? Discussion in '"Boat Anchor" & Classic Equipment' started by WB2GCR, Nov 30, 2017. Was really wanting to see pix of Harrison Radio's store in NYC, like it was in the old QST ads. Can't find a single image online! rows of shelves chock full of just about every rig under the sun. All the radios that a kid would lust for and want, but could not possibly afford. Hard to imagine that no images of Harrison have survived to this day! Found this site not just specific to Harrison Radio but still interesting with photos of Radio Row etc. "As you walked beyond the immediate Radio Row area north on Greenwich where it joined West Broadway, Harrison Radio was located at #10 West Broadway -- a ham's paradise for equipment. Several subway stops north would place you on Canal St., another long street of surplus supplies covering radio, electrical, plastics, and everything else. 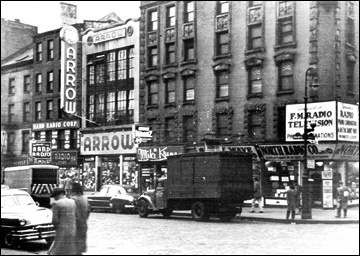 TAB ("That's a Buy"), a surplus store, was at 512 Broadway and 6 Church St. Grand Central Radio was at 45th St. near Madison, and there were several other stores at 14th St. around Union Sq., Packard, etc." also search under Radio Row and Canal St. I too have been unable to find any online photos of Harrison Radio. A quick search of the QST archive did not find any "articles" under Harrison or Harrison's. Unfortunately I don't have time to search the QST adverts in my other files, which are NOT available in the QST archives. b. Here's a photo that appeared in a Harrison ad in the back of the 1964 edition of the ARRL Handbook. K1OIK, KX4OM, WB4TAA and 6 others like this. Yep, dat be da place... but I'd really like to find a GEN-U-WINE photograph! Wonder if the ARRL kept all the advertising originals in a basement?? Why is that not a GEN-U-WINE photo? I visited Harrison a number of times and it look pretty much just like that -- complete with the banner. The "original" photo --certainly long gone-- would have been in the hands of the advertising agency that did the ad layout, not the ARRL. They, or more likely their printer, would have received just the ad layout "mat". OK guys, try to ID as many of the radios in this ad as you can. Ready, GO!